If you would like to learn Spanish in Buenos Aires, Argentina, and you like to have fun, the Spanglish Exchange program is for you! After spending a couple of years living in Uruguay, I decided to take an extended trip to Buenos Aires because it is such an amazing city. I had been to Buenos Aires a few times because I had to renew my Uruguayan Visa. However, these were just weekend trips and I didn’t have a chance to really know the city. I believe that to really know a city you have to live there and get to know the people and places that are its heart and soul. Some people find it curious but I have always enjoyed arriving in a new city where I know nobody. I’ve never really understood this curiosity because the life complaint I hear from these same people is: My life is kind of monotonous…I do the same thing everyday. And trust me, when you arrive in a new city and do not know anybody, you have no idea what will happen. Monotony is not something on the menu! So, upon my arrival in Buenos Aires, I wanted to get to know the city and the Spanish Language a bit. Now, the first item on the agenda for many people is to hit the museums and target the main attractions. However, this is not how you meet the local people or embrace the local language–everybody at these locations is a tourist! The best way to accomplish these goals is at a local bar. Who are the people at a local bar? Bingo, the locals. And what language do they speak? Bingo again, the local language. Now, some people are challenged by meeting others in a bar; I don’t often feel so encumbered. Generally, you can strike up a conversation with the bartender and eventually others will chime in and you’re off and running. This does not always work but it’s usually a pretty good strategy. In Buenos Aires though, it’s even easier! If you are in Buenos Aires, you can meet great local people, practice lots of Spanish, and drink a beer if the mood suits you. It all takes place several times a week at an event called Spanglish. The concept is so simple but so perfect at the same time. There are local Argentines who want to learn and/or practice English and there are English speaking visitors who want to learn Spanish. BING BANG BOOM–let’s get them together! That’s Spanglish in a nutshell. So, when I arrived in Buenos Aires, I signed up for the one-month plan. In my first week, I went to every Spanglish event, which are at various bars throughout the city. And, not only did I go to them, I walked to every one of them, which allowed me to see so much of the city that otherwise would have remained unexplored. It gets you in shape too. Palermo to San Telmo is a long walk! So, after long, scenic walks, I would arrive at Spanglish to be greeted by the welcoming staff (you can friend them on their Facebook page) and often a complementary beer, a necessity after a long walk! Let’s take a quick look at how Spanglish works once you arrive. After the first half hour or so when everyone mingles, has a beverage, and gets signed up, you spend the next one hour and a half meeting people from Buenos Aires and speaking with them, half in English and half in Spanish. This is a great opportunity to know the wonderful people of Buenos Aires and improve your Spanish language skills. 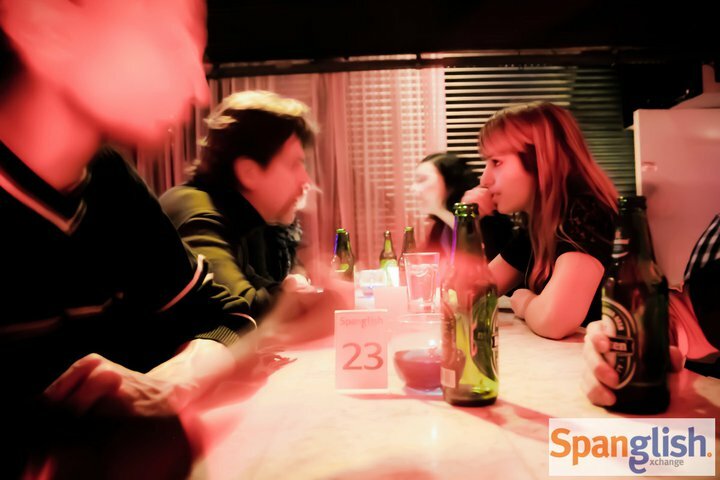 I have heard a couple of people mischaracterize Spanglish as speed-dating. Now, I have never done speed dating, but I guess the format is somewhat similar and thus the mischaracterization. However, in Spanglish, you talk with the same amount of men as you do women, meeting a whole variety of people, who you will likely do things with outside of Spanglish as well. The conversations and the amount of Spanish you learn are completely dependent on you. If you keep your conversations limited to “what’s your name?”, “where are you from?”, “what do you?”, then your learning of Spanish will be limited as well. I recommend that you check the local news and see what people think of the various events going on in the city. This will allow you to learn new vocabulary and get a perspective of the people and events in Buenos Aires. For example, one recent event that occurred here was that the government of Christina Fernandez seized most of the country’s oil from private companies. I talked to several people about this and learned that many people who live in Palermo (a wealthier area of BA) are not too fond of the lovely Christina and her more liberal approach to politics. One night I sat down in Spanglish, just met the person, and she asked me: “So, tell me, are you living the life that you dreamed of as a child?” I thought, damn girl, you’re going deep straight away. I loved it because it was so out of the ordinary. I’m expecting “where are you from?” and she delivers that. I like those kind of surprises! There are many different ways to learn Spanish in Argentina but few offer the fun, economy, and possibilities of Spanglish. One of the ways to learn Spanish is to go to a school and learn through books. Doing this, you can get a good start and learn the basics of structural Spanish. But, classes like this do not help you when it comes to actually talking with people in conversational Spanish. Do you know what helps you learn conversational Spanish? Conversation! This is what Spanglish offers and it all takes place in a fun, friendly bar environment.